GoodGame explores the positive impact games can have on our lives, communities and the places where we live. Through this project, we take games seriously: as valuable, engaging tools that can improve people’s lives, more than just a form of entertainment. Games can create immersive worlds, encourage collaboration and empathy and motivate us to solve problems or think about where we live differently. In Summer 2018, we commissioned four artists to work with us to explore the potential for games to benefit the communities of Smethwick and Bearwood. The artists delivered a wide range of activities, from workshops in libraries and sessions with community groups, to unannounced pop-ups in parks and on the high street. Together we explored how games can be a tool for collaboration, creativity and motivation. All kinds of games were played, from traditional street games to card games and drawing games. 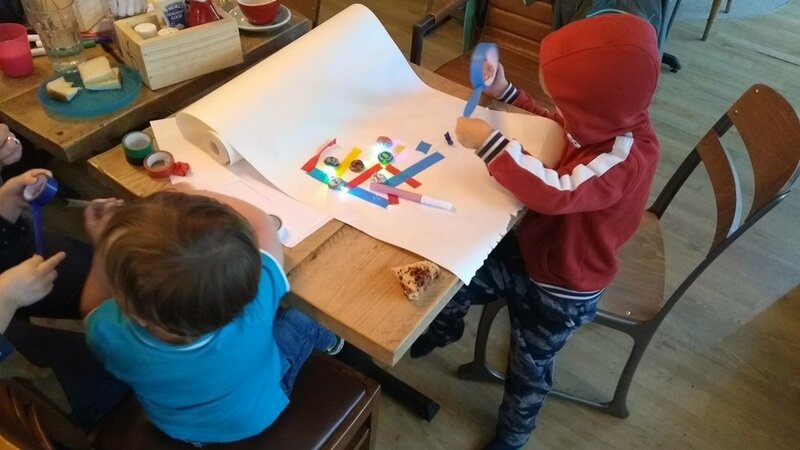 Games were often played in usual locations, such as on the high street, in a library or in an indoor market, suggesting that these everyday spaces can be reimagined and repurposed for play. Many of the games developed by the artists encouraged people to remake and remix them, adding or taking away rules, to encourage collaboration and ownership. Playable Bearwood is a series of challenge cards based on the concept of ‘random acts of kindness’, designed by Gizzago. Players complete a challenge and then pass the challenge card to another person - often someone they don’t know, or leave them in a public place for someone to find. Anyone in the local area could be a player. All of the challenges were designed by Bearwood residents and many of them focus on encouraging care for others or looking after the local area. Several submitted designs were text only; local illustrator Annabel Evans was commissioned to illustrate those cards using her Bearwood Bear character. ﻿Anna ran a number of workshops in Warley Woods, a local park in Bearwood, where people were encouraged to play traditional games and then reinvent and remix them. She also worked with Polly Tisdall, a storyteller and theatre maker, to explore narrative games and how families could work together to create their own game-like worlds. Together, these activities informed the creation of Pocket Park Games, a compendium of games and activities that encourage people of any age to explore urban green spaces in new ways. Pocket Park Games will be distributed to parks, green spaces and community venues in The Black Country and Birmingham from October 2018. To request a pack, please email: matt.andrews[at]ampersandprojects.org. ﻿The Games Exchange was a space where people could meet and exchange games, teaching each other the rules and playing games with people they didn’t know. Betab was interested in the cultural significance of games and their ability to bring people together from different backgrounds. For two days, a small unit in Bearwood Indoor Market was transformed into a space where people could meet and play games together. Betab was inspired by the handwritten signage of the other stalls in the market, so this was recreated in The Games Exchange by designer Kerry Leslie. The GoodGame pilot was supported by Creative Black Country and funding from Arts Council England’s Grants for the Arts and Big Lottery Fund’s Awards For All. We are currently developing the next phase of the GoodGame project. If you’d like to work with us, please get in touch!